I come from the school of thought that says a book should be kept in its most pristine state possible. I cringe at the thought of turning down a corner to mark a page, or scribbling notes in the margin. And as to your suggestion of underlining key topics, I have a retort at the ready. If you do so, you'll just focus on the underlined portions and you'll neglect to study and ultimately fail to master the remaining material. Taking the time to think about this practice, reveals another reason I don't write in my books: I'm a coward. It's the same reason I prefer to draw in a hand sewn sketchbook over a finely finished one from the book store. That voice that says: you're going to mess this up can be awfully convincing. Bottom line: don't mess with my books. Yet, as of late, I'm finding myself rethinking my position on this topic. This past week I picked up a book that was my Father-in-Law's (Z"L). As was his practice, it's filled with underlined, emphasized and annotated text. The result: I feel like I'm reading along with him. When I find a particularly elegant point in the book, and he's already marked it as such, I find myself nodding my head in agreement. It's been an unexpected joy. I'm seriously considering doing the same thing with a number of my favorite books. SICP. The Dip. In a Sunburned Country. These books had a profound affect on my life, and I see a unique way of sharing these insights with others. Of course, I'd have to buy fresh copies of these books to annotate. No way am I marking up my existing copies. What can I say, old habits die hard. 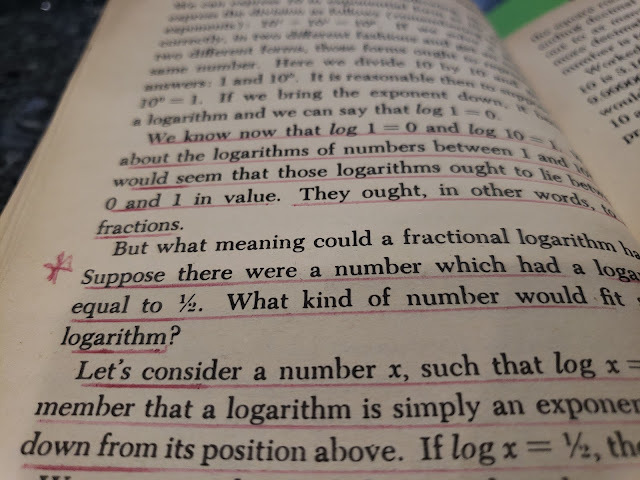 Incidentally, the book that inspired this post is an Easy Introduction to the slide rule by none other than Isaac Asimov. As I've blogged about before, I have a special fondness for slide rules, and this book is a terrific exploration into why and how they work.